pCloud is the secure place for your photos, videos and documents. Access your files from every device, anywhere you go. Start with 10 GB free storage and automatically backup your photos and videos and free up space from your device. Easily preview photo albums, stream your favorite HD videos and listen to your personal music playlists anytime, on the go. 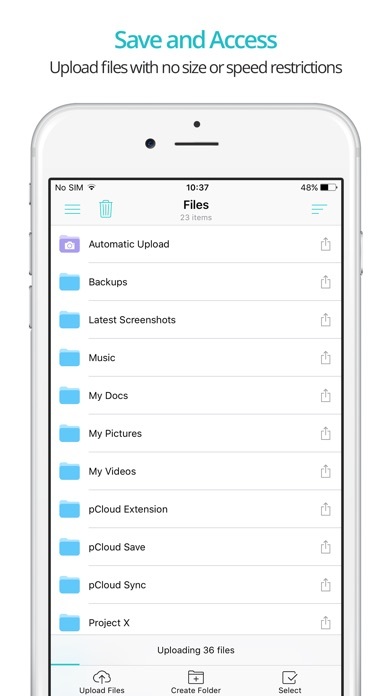 Send large files with a tap, even to people who don't have a pCloud account. All the changes you make to your files will be immediately synced across all your devices. pCloud is available for your iPhone, iPad, Mac, Windows and Linux device. • Start with up to 10 GB cloud storage space when you sign up. • Go Premium and get up to 2 TB for your entire digital collection. 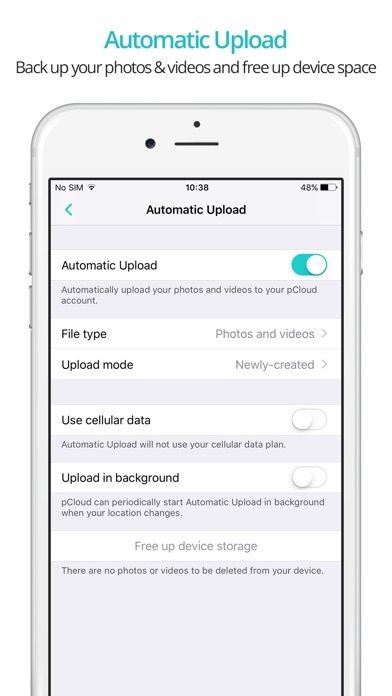 • Automatically backup photos and videos and free up space from your device. • No file size limit - upload Full HD files without worrying about their size. • Add and share large photos, videos and documents at the highest internet speed available to you. • Allow offline access for files and folders and access them without internet connection. • Allow your friends to upload files, without giving them access to your entire account via Upload links. 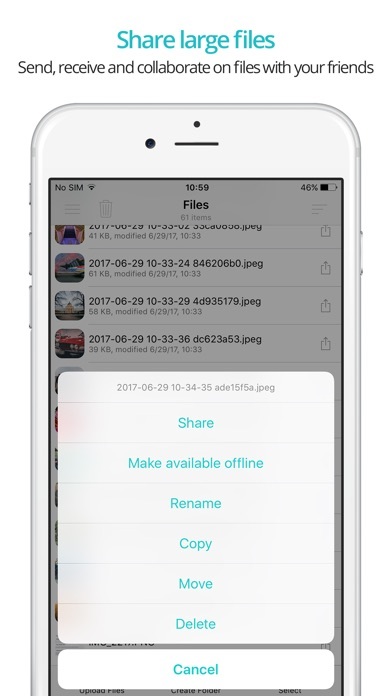 • Instantly share large files with friends and family via Download links. 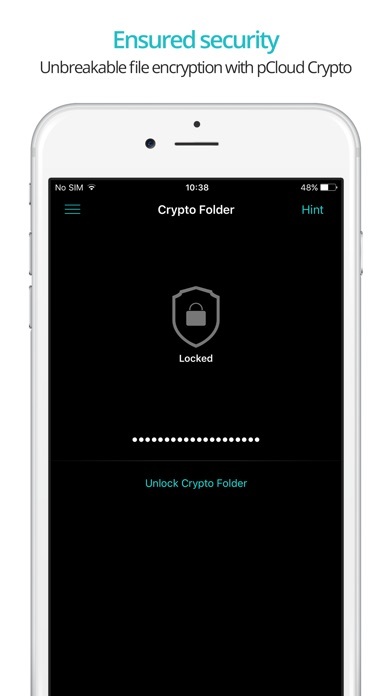 • Military-grade file encryption with pCloud Crypto. pCloud offers in-app purchases, which include subscriptions to 500 GB (Premium), 2 TB storage (Premium Plus) and client-side encryption (pCloud Crypto). Subscriptions purchased in-app renew monthly or yearly depending on your plan. Any unused portion of a free trial period will be forfeited when you purchase a subscription to the same product. To avoid renewal, you must turn off auto-renew at least 24 hours before your subscription ends. You can turn off auto-renew at any time from your iTunes account settings. • Premium 500 GB monthly for 4.99 USD billed each month. • Premium Plus 2 TB for 9.99 USD billed each month. • pCloud Crypto for 4.99 USD billed each month. • Premium 500 GB yearly for 49.99 USD billed annually. • Premium Plus 2 TB for 99.99 USD billed annually. • pCloud Crypto for 47.99 USD billed annually. • Premium 500 GB Lifetime for 174.99 USD billed once. • Premium Plus 2 TB Lifetime for 349.99 USD billed once. • pCloud Crypto Lifetime for 124.99 USD billed once. Lifetime plans have a duration of 99 years or the lifetime of the account holder, whichever is shorter. If you choose to purchase, you will be charged a price according to your country. The price will be shown in the app before you complete the payment.